With it's chiseled, muscular exterior and modern, ergonomic interior, the newly redesigned 2004 Ford F-150 was unlike any other pickup that we had ever seen. It's bold front end design conveyed strength. The larger wheel openings and beefier tire and wheel options seem to verbally communicate that more powerful engine choices now lay beneath the hood. Already the dominant force in the pickup segment, the 2004 Ford F-150 would up the ante and again redefine America's favorite truck. With a bigger and bolder exterior and a more refined interior, the 2004 Ford F-150 offered a revolutionary level of comfort and spaciousness that was unparallelled in a pickup truck. Exciting new engine choices, a fully-boxed frame, and a passenger compartment that was six-inches longer than its predecessor meant that the 2004 Ford F-150 was also bigger, tougher and more capable than any other truck in the segment - past or present. 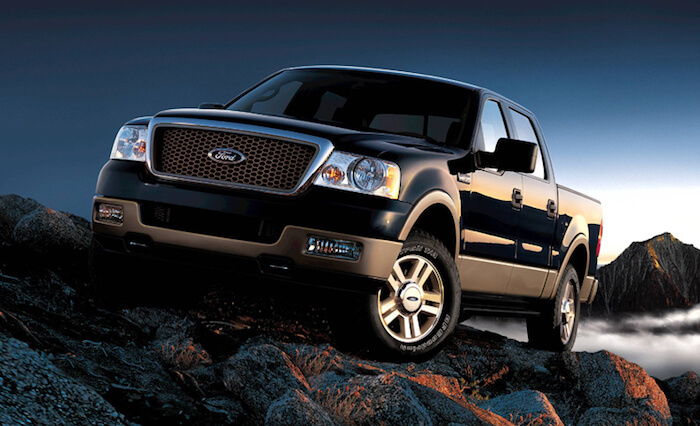 The most notable feature of the redesigned 2004 Ford F-150 was the all-new exterior. A new wrap-around front fascia and quad-circle-type headlamps add to the front grille design that signifies pure precision. The sturdy front bumper with integrated fog lamps (if applicable) and functional tow hooks (4WD models) complete the bold new first impression. A higher beltline helps to accentuate the sleek fender, door, bed panels, and low roof line that is almost intimidating in its attractiveness. Despite the new exterior design elements, the 2004 Ford F-150 seemed to loudly proclaim that time-tested Ford Tough Truck tradition. For the first time, all cab configurations featured four-doors for ease of access. The Regular cab, with a single row of passenger seating, had short rearward-swinging access doors for the storage compartment behind the seat. The SuperCab had two rows of passenger seating in an extended cab with four-doors. The rear-doors were rear-swinging. SuperCrew cab models had four frontward-swinging doors and two rows of passenger seating. 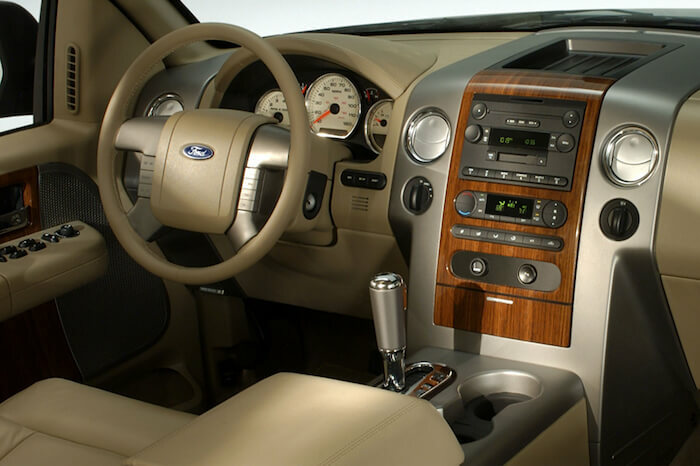 Inside the expansive cabin, the 2004 Ford F-150 continued to raise the standard of craftsmanship and refinement. Reduced interior noise and more attention to detail would provide enhanced passenger comfort and safety. An all-new modular design with bold vertical bands allowed the Ford design team to combine diverse colors, textures, and materials to the two-tone instrument panel. Three new instrument panel designs give each trim level a unique interior aesthetic. A flow-through center console and an industry-first modular aluminum overhead rail system served to set the 2004 Ford F-150 further ahead of the competition. The brushed aluminum rail system is integrated into the headliner and begins right behind the rearview mirror with the dome light and a center console. Auxiliary systems like a first aid kit, a flashlight, or a tool box could be added at your convenience. The 2004 Ford F-150 was not only the next step in the evolution of the world's best-selling vehicle, it also made the statement that Ford trucks were better looking, more rugged, and reliable than ever. So the big news was of course the fully redesigned from the ground up 2004 F-150. However, Ford did keep producing the old body style F-150 and called it F-150 Heritage. It was produced because there was more than one F-150 factory so they kept the old body style going so they didn't have to shut down multiple plants to re-tool at the same time. It's very costly to stop production at all plants. The F-150 Heritage model for 2004 was only available in XL or XLT trim levels, and in regular cab or Super Cab configurations. 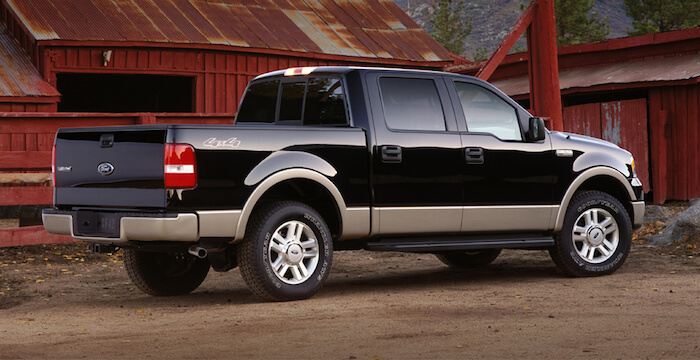 All of the same 2003 F-150 engines were available - 4.2L V6, 4.6L V8, and 5.4L V8. The Bi-Fuel Prep 5.4L and Natural Gas 5.4L were also still available. Wheel choices were limited to four 16" versions. A styled steel, polished aluminum, and a cast aluminum 5-spoke. The 7,700 lb payload package was also available (it got it's own 7-lug 16" gray steel wheel), as was 4WD. 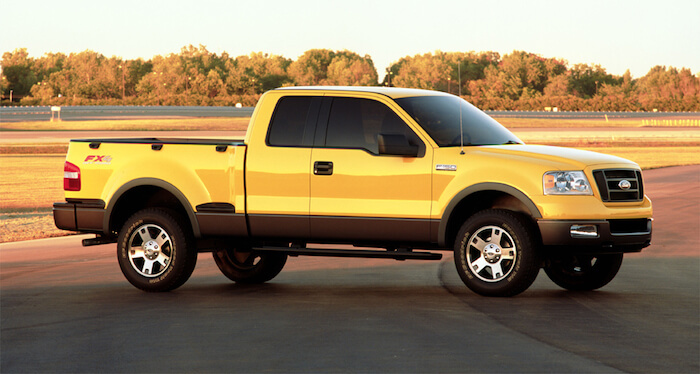 Visually, the 2004 F-150 Heritage was identical to the 2003 F-150 model.